Shingle technology has come a LONG way since the concept was first introduced around 1893. As science and technology have brought along better materials and methods, it has unilaterally affected the way we live our lives, and the impacts on roofing are no exception. One of the most intriguing improvements has been in how we subvert wind damage. From the inception of the asphalt shingle, all the way through to the 70’s, wind damage was a real problem. There were very few ways to combat this issue. The only option roofers had at their disposal was to smear hot, smelly (and likely carcinogenic) tar underneath the shingles in order to hold them down as much as possible. Despite the headache’s (both emotionally AND physically), this was not an incredibly effective method. The whole process was entirely contingent upon the roofer slathering on the tar liberally enough and evenly enough that there were no gaps in the tar anywhere around the roof. 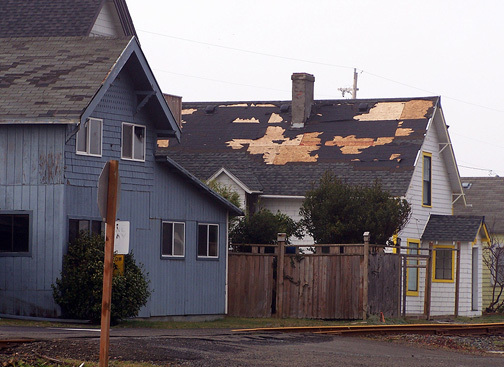 Consider that there is anywhere from 900-1,500 shingles installed on your average roof, and you can begin to understand why this approach to minimizing wind damage was such a challenge! Then we began seeing the introduction of the fibreglass shingle, which is by far the most common asphalt shingle used today. This innovation was initially resisted, despite having much better fire rating, because the old “organic shingles” were heavier and therefore more stable against an onslaught of heavy winds. That brings us to today, where technology has bestowed perhaps one of the most magically simple innovations in roofing in the last 50 years: the self-adhesive strip. Today, every single shingle comes equipped with a perfect tar line across the bottom, that heats up in the sun and melts itself to the shingle layer directly below it and seals. This not only saves a huge amount of time, but it also provides homeowners with a roof that is more resistant to wind and has allowed for the flourishing of the fibreglass shingle due to the fact that wind resistance is more related to the resistance of the self-adhesive strip than the physical weight of the shingle. This allows homeowners to select a shingle with a higher fire rating AND one that is lighter and not putting undue pressure on their roof. “When people think about wind events they think, ‘oh well, it could tear the roof off my building or my roof could come loose,'”… “But the biggest effect of wind events that I’ve seen is the potential for wind-blown debris to damage the roof.” That means when inspecting the roof after a wind event, it’s not enough to check that areas are tight and that attachments are still good. Investigating what might have blown onto or across the roof is also necessary. Finally, Dayus Roofing emphasizes that when working with insurance companies, homeowners keep in mind that they have the right to choose whatever contractor they like. So there you have it. A brief overview of what the modern homeowner needs to be aware of to keep their roof well protected from wind and storm damage. Stay safe out there, homeowners!